While I have long been interested in community engagement, overseeing writing center consultants work with disadvantaged teens and refugees from Syracuse’s poorest neighborhoods, for the last few years I have been working on a different kind of paradigm that reflects my experiences with and interest in self-publishing. From 2014-2015, during my 4th year in the PhD program at Syracuse, I was awarded a fellowship from the New York Council for the Humanities to carry out a public program I had originally conceived with my colleague and friend, Patrick Williams, called Syracuse in Print . 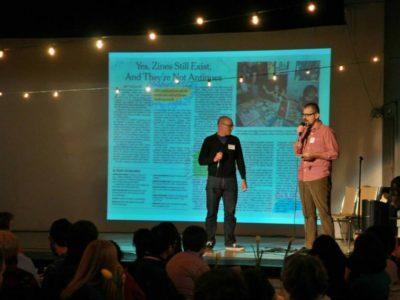 When Patrick and I pitched Syracuse in Print (unsuccessfully) at a local crowdsourcing dinner a few years earlier, we were inspired by the variety of small press festivals popping up all over the United States. We imagined an organization that would host a similar festival in the City of Syracuse, showcasing diverse narratives of a variety of writers through publication, but also work with them through grants, workshops, and other smaller events, aiming to build a more visible culture of writing and print in our community. “Zines in Your Library.” Workshop for research and public librarians. 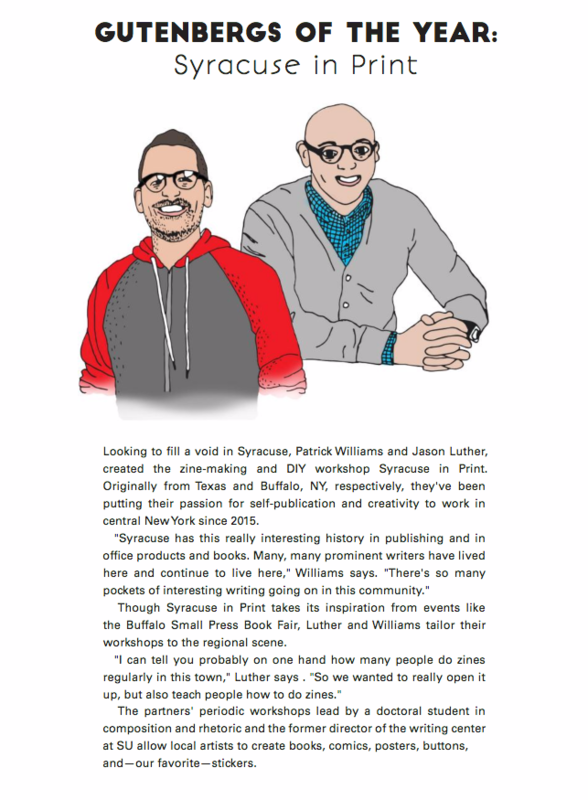 Syracuse in Print and the Central New York Libraries Resources Council. April 2016. As I worked on this project through my fellowship, however, I realized just how time-intensive this project was. Thus, we scaled back our ambitions and focused on smaller events. One of these was a zine swap held in the fall of 2015 at Lightwork, a public photography space near the University. This program featured speakers on bookbinding, publishing, illustration and collage art. Later that spring, we hosted another event — this time a workshop for research and public librarians co-sponsored by Central New York Libraries Resources Council. 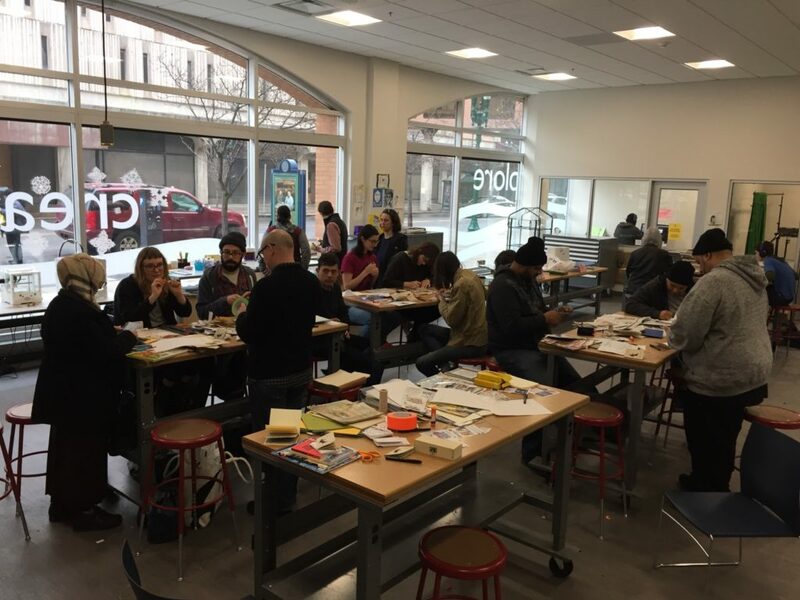 Most recently, we ran a well-attended workshop at the Onondaga County Public Library’s new MakerSpace. Although we have yet to host a bona-fide festival, Syracuse in Print looms large in terms of my ambitions for future service. One of my goals is to use my position as a faculty member to build toward a model of community publishing that doesn’t rely on community presses or university sponsorship directly. At the same time, such approaches don’t require total isolation. Even as Syracuse in Print has boasted its independence, we find ourselves being visible to several on-campus stakeholders and organizations. In May 2017, for example, our favorite student-run publication, Jerk Magazine, recognized Syracuse In Print in its final issue (see below).